The Rhinesomus triqueter, also known as the Smooth Trunkfish, is a largely solitary fish, though they sometimes move in small groups. Typically found in warm waters, these animals are found near coral reefs and sandy seabeds and can be observed during a Key West snorkeling trip. The general habitat of the trunkfish spans the Caribbean, the Gulf of Mexico, and the Western Atlantic Ocean from the waters off the eastern coast of Canada to Brazil. 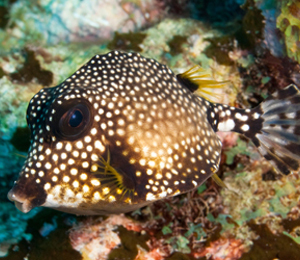 Trunkfish mostly swim at a depth of approximately 50 meters. Ranging from 7.9 to nine inches in length, trunkfish are characterized by a body with dark background coloring and white spots. The fish have a pointed snout with small circular lips and a tail that is shaped like a brush. As trunkfish consume a diet that consists of mollusks, worms, crustaceans, tunicates, and sponges, the fish expel a jet of water from their protruding mouth, which disrupts the seabed and reveals potential food sources that may be buried just beneath the sand. In some areas, rhinesomus triqueter are caught as a food source for humans. However, the fish produces ostracitoxin, which is a poison that is released through its skin. The chemical is released when the fish is stressed and has the potential to poison entire aquarium tanks and systems, killing other animals that inhabit the environment. Therefore, humans must exercise caution when capturing the fish and storing them as food or when keeping them for recreational purposes.